It looks as if the Nancy Pelosi anti-business strangle-hold on the House Democratic caucus may be weakening just a bit. The Blue Dog coalition which I thought died years ago, published a document saying it’s open to lowering business taxes and other parts of the GOP tax plan, the first significant sign of a crack in Democratic opposition to the GOP approach. However, there is still a long way to go before they are in the same neighborhood as the Republicans. 1. Republicans must abandon the failed, partisan reconciliation process for major reform, and follow through with the expectation of using an open, bipartisan process and regular order. 2. Tax reform must be credibly revenue neutral, and unrealistic, rosy economic-growth projections should not be used to offset the costs of tax reform or tax relief. 3. The middle class must be the priority, and tax reform should not shift the distributional balance to the wealthy. 4. American companies need a more competitive corporate tax rate and structure in order to maintain their ability to compete globally. Congress must also account for the needs of small businesses when it comes to setting tax rates. 5. We should consider using tax reform as an opportunity to address the funding challenges for the Highway Trust Fund. 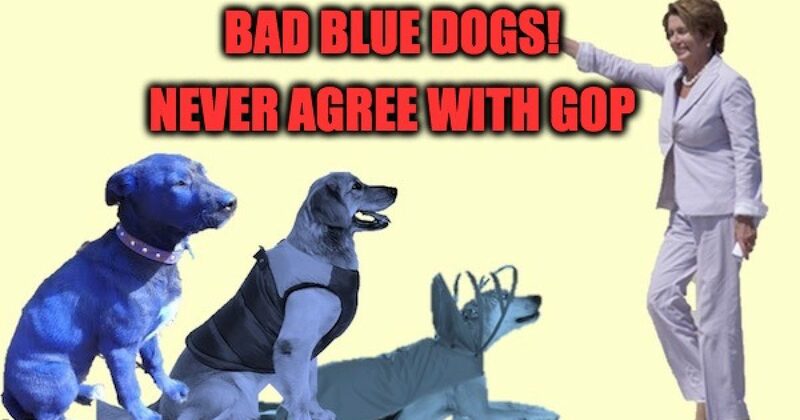 The Blue Dog proposal comes as Republicans are trying to build support for their nine-page tax framework, released last week, which faces opposition from many Democrats and objections raised by a handful of GOP lawmakers. Tax-writing committees in the House and Senate must now settle some of the most divisive issues, including where to set the top individual income tax rate and whether cuts should be paid for. In order to maintain our ability to compete globally, American companies need a more competitive corporate tax rate and structure. If we move toward a territorial tax system, we must take steps to prevent companies from shifting income and jobs to offshore tax havens. We can do so by implementing low-level taxation on foreign earnings, strong anti-base erosion rules, or other methods to keep sufficient revenue. Congress needs to be cognizant that not all U.S. firms operate globally, so tax reform must balance foreign tax regime changes with the needs of all domestic firms, especially small and medium enterprises. We should incentivize American companies to reinvest the benefits of tax reform into new jobs, increased wages, worker training, and facilities in the U.S. instead of profiting stockholders in ways that do not represent real investment needed for long-term economic growth. We recognize that companies have developed business plans based on existing tax rules, such as certain accounting or expensing provisions. If reform of these business provisions is pursued, companies must be provided clear transition rules and sufficient time to adjust to new tax structures to avoid disruptive shocks. We must reduce the tax burden on small businesses, which are often structured as pass-throughs. Based on the lessons from Kansas, we agree that we must develop strong rules to prevent taxpayers from mischaracterizing wages as pass-through business income. These tax rules should also be structured so that benefits target Main Street businesses instead of entities like Wall Street hedge funds or partnerships. The tax code should incentivize innovation, expanded research and development, and commercialization, and set a foundation for the manufacturing of those goods in the United States. Even, “The middle class must be the priority, and tax reform should not shift the distributional balance to the wealthy.” Doesn’t conflict with the GOP priorities. It remains to be seen whether some of the other provisions such as eliminating the reconciliation process and revenue neutral can be negotiated (although reconciliation was originally written for the taxation process. It is, however, a crack in the armor and a break with Pelosi. Who knows? In the end, the may give their leader a cow.